Image from The Ice Stupa Project gallery. In the extreme north of India, there is a cold desert that extends from the Kunlun mountain range into the Himalayas known as Ladakh. The region is home to many villages, where locals make their living by farming grains, vegetables, and trees. Villagers depend on the Indus river and glacial streams to divert water to their crops through intricate canals that nourish their soil. Unfortunately, the water supply of Ladakh is too erratic during the most crucial months of the farming season due to climate change. Through April and May, farmers are fighting to keep their gardens from drying up, while in June their crops are waterlogged by flash floods and excess water streaming from the melting Himalayan glaciers. With the world’s increasingly unstable climate, a natural solution seems out of reach for the people of Ladakh. 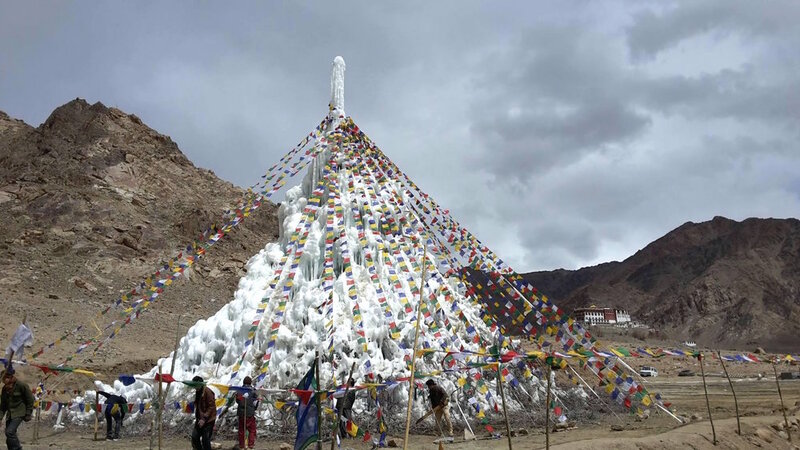 However, several different groups in Ladakh have come together to form The Ice Stupa Project. The Students’ Educational and Cultural Movement of Ladakh (SECMOL), is an alternative learning institute in the high desert region that began as a movement for education and government reform. Now, SECMOL is its own unique institute where students, staff, and volunteers are equipped to build sustainable futures for themselves and others in the Ladakhi mountains. After two years of experimentation, SECMOL has partnered with the Drikun Kagyu Monastery to form a system of artificial glaciers that will provide water to Ladakh when it is needed most. The structures were named “Ice Stupas” for their resemblance to the dome-shaped shrines of Buddhist culture. Engineer and founding-director of SECMOL Sonam Wangchuk creates a practical system by saving the water that would normally go unused during the farming off-season. It is in the height of the Ladakhi winter, when temperatures can become -50°C, that underground pipelines are connected to nearby streams and rivers. Gravity drives the water downhill through the pipes until reaching the stupa site, where pressure forces the water to rain out of the now towering pipe. Over time, the extreme cold causes the flowing water to freeze and eventually form a large cone of ice. The Ice Stupas are then sustained until the farming season begins and the local streams are running low. The glaciers melt as temperatures rise, and the water flows steadily into connected gardens. In 2016, the first Ice Stupa was used to provide water for crops during the scarce months of the summer. People from the nearest village volunteered to plant 5,000 trees, which were all connected to and successfully supported by the artificial glacier. With this success in mind, SECMOL is prepared to expand their use of Ice Stupas to not only better the lives of farmers, but for all of Ladakh. SECMOL is establishing itself as an institute that fights to better the lives of future generations through innovative and sustainable technology. Wine To Water is excited to see what other projects SECMOL and their partners will undertake to combat climate change and the obstacles of the Ladakhi people.